Brihat is an exposition of the immense classical culture of Bhakti that originated in South India and its evolution in perpetuity. 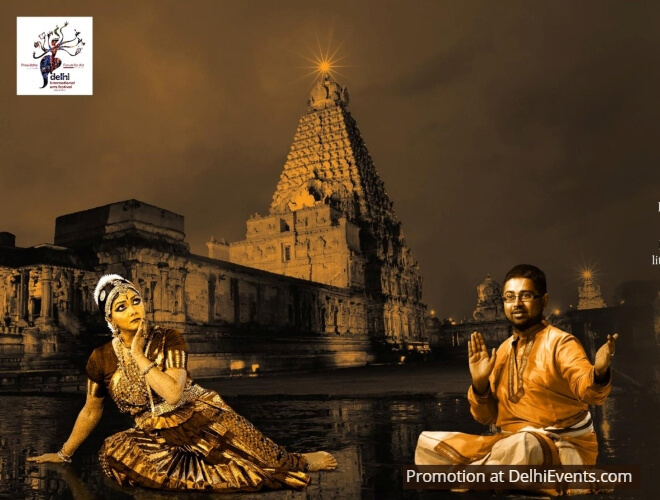 It transposes audience into a truly artistic renaissance of history, literature, music and classic Bharatanatyam in the Thanjavur style. A renowned architect, dancer and designer, Krithika Subrahmanian is trained in the pure lineage of the Thanjavur Pandanallur Bani of Bharatanatyam under the tutelage of Padmashri Prof. Sudharani Raghupathi since the age of seven, Krithika Subrahmanian has performed extensively since the age 15 at prominent venues and festivals (solo and group). A restrained yet eclectric pattern of juxtaposed tradition and modernity has emerged as her unique trademark in concept space. It has made her one of the most exciting dancers to watch in India. Krithika Subrahmanian has focused on creating the successful NaMaargam Dance Company which stands for the highest standards in performance quality and profound Hindu Dharma. Krithika Subrahmanian’s sensitivity to selection of well researched content and details, deep commitment to the art and revival of Indian craftsmanship through various initiatives is unparalleled. It has been her forte to artfully blend various influences to provide definition for a distinctive yet pluralistic language that is an inspiration for others. Dushyanth Sridhar is one of the most sought after speakers on Sanatana Dharma as he is well-versed in Ramayana, Mahabharata, Purana, Vishnu Sahasranama, Bhagavat Gita and Divya Prabandha. He renders upanyasams (religious discourses), harikathas (musical discourses) and also gives corporate lectures in English and Tamil interpersing with words in other Indian languages whenever necessary. Dushyanth Sridhar has rendered over 1500 live discourses in 75 cities and 12 countries (India, China, Nepal, Indonesia, UAE, Australia, New Zealand, Kenya, Canada, USA, Sri Lanka, Singapore). He has a wide spectrum of followers on YouTube with over a million views, a subscriber base of 10000 and content that runs for over 300 hours. Dushyanth Sridhar is an alumnus of BITS- Pilani currently employed with an IT major as a consultant and lives in Bangalore with his wife who is also a consultant. He is a visiting faculty in business schools for management courses.